We’d love your help. 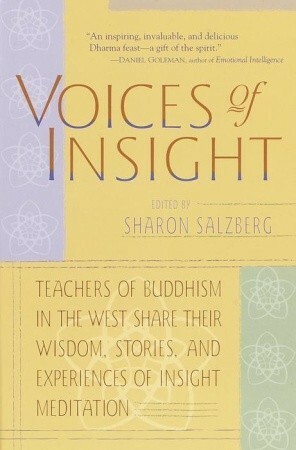 Let us know what’s wrong with this preview of Voices of Insight by Sharon Salzberg. In this anthology, leading Western teachers of Buddhism share their personal experiences on the path of insight meditation; their understanding of the basic teachings of the Buddha; the lessons they've learned in their training with their own teachers; and some good advice on following the Buddha Dharma in everyday situations of work, family, and service. Contributors incl In this anthology, leading Western teachers of Buddhism share their personal experiences on the path of insight meditation; their understanding of the basic teachings of the Buddha; the lessons they've learned in their training with their own teachers; and some good advice on following the Buddha Dharma in everyday situations of work, family, and service. To ask other readers questions about Voices of Insight, please sign up. I've just finished this book for the second time and it again was a very liberating and enlightening reading experience. There is so much wisdom in it, that I could re-read it again and again. My favourite this time was Joseph Goldsteins text about the art and science of meditation. But all the others are great too. Its like, every time I reread it, I am a different person and so, different authors and essays speak to me. Sooooo good! This compilation had a mix of inspiring stories and trite lectures. I appreciated the essays where the writers talked about their personal experiences and the people they admired. Beautiful collection of writings by the teachers at IMS (Insight Meditation Society) in Massachusetts. Some very moving, insightful, accessible, and sometimes very poignant and direct writings on life, death, illness, happiness, and everything that is our practice. Originally put together as a fund raiser for the late Ram Dass after he had his stroke. I highly recommend this book for Buddhists and anyone interested in the path. Need to put this in the rotation of books to read for your spiritual practice. One of America’s leading spiritual teachers and authors, Sharon Salzberg is cofounder of the Insight Meditation Society (IMS) in Barre, Massachusetts. She has played a crucial role in bringing Asian meditation practices to the West. The ancient Buddhist practices of vipassana (mindfulness) and metta (lovingkindness) are the foundations of her work.